The careful removal of a tree, dismantling it piece by piece as opposed to felling the entire tree as a whole. If the area is clear below the tree, the branches and logs can either fall or be carefully thrown to the ground. If there are obstacles below the tree, or if the pieces are too large or heavy for the climber to hold, then this task can be carried out by using lowering ropes, pulleys and a friction device to lower the tree parts to the ground in a safe and controlled manner. Why would I need tree dismantling? There are several reasons why you may require a tree dismantling service. These include where there is limited space surrounding the tree, or there may be obstacles of value or concern, such as a conservatory below. If there are obstacles in the vicinity, we use ropes and pulley systems to safely lower branches and logs to the ground. We use the best equipment and techniques to enable us to dismantle your tree safely, and always endeavour to cause as little disruption to your day to day routine as possible. We have experience of taking down small and very large trees, so no job is too big or small for us to undertake. The method we use will depend on the size and condition of the tree. 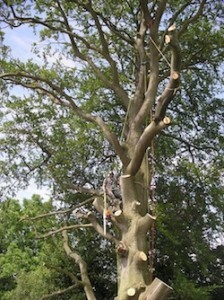 Large and damaged trees may require specialist dismantling using a crane or a mewp (mobile elevated working platform). We can offer tree removal services to the Nottingham and surrounding areas, although we are willing to travel further afield if required. Contact us today if you have any questions, concerns or require further advice about our tree dismantling and removal service. We are always happy to offer free advice and can provide a no obligation quote. See all our tree care services here.